I don’t necessarily consider myself a movie expert, but I know a good movie when I see one. I also know that movies usually have a good moral and are often inspirational. There are so many movies out there that you can really learn from and lot of them are set in the typical college atmosphere. Here are some movies that can certainly educate and motivate college students. This movie takes place at Wellesley College in the 1950’s, where Julia Roberts plays a never-married professor who has an open mind about life and love. She finds that her students are extremely book smart but do not know what they can truly do with their life. She encourages them to go on to law school and not focus on the social norm of getting married. The moral of the story? Have an open mind and don’t limit yourself. This is a good idea to remember as you are in school. If you are a woman, or a minority or don’t think you can succeed, remember that you should always aim for the best. Anyone can succeed if they try hard enough. This is an incredibly inspirational story that begins with an MIT janitor (Matt Damon) solving a complex math problem on a chalkboard. A professor notices his talents and tries to help him out. 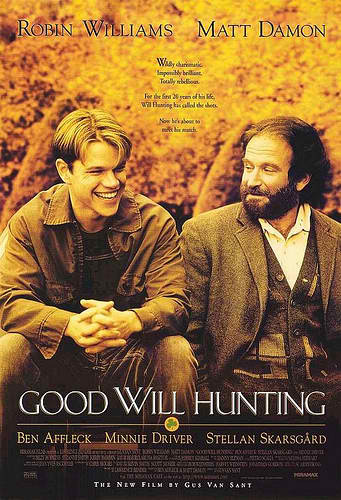 Damon, as Will Hunting, agrees to see a therapist (Robin Williams) who helps him stay out of jail and shows him his potential. Hunting has a hard time dealing with all the changes in his life but he realizes what he could do if he set his mind to it. This movie shows that any one can make it. Those who don’t think they are smart enough, or rich enough for college, need to learn from this movie. There is a way for everyone. Facebook’s creator, Mark Zuckerberg is played in this recent movie by actoe, Jesse Eisenberg. He is portrayed as a lonely and kind of arrogant genius who cannot seem to keep any friends. He invents this social network and along the way meets some enemies. The moral of this story is to be careful of who you offend. Sometimes, making enemies isn’t worth it and sometimes it is. In your own lives, you need to decide for yourself. It is also a good thing to remember that you should not be “too cool” for people on campus. Branch out and you will make friends. We’ve all seen or at least heard about this one. A super blonde sorority girly-girl, attempts to get her boyfriend back by going to law school. She is lost in this place at first and has no idea what she’s doing, but she makes it and ends up proving him wrong. Plus, she meets a guy that is better for her anyway. It is definitely your typical chick flick but it does have significant themes to it. Elle, played by Reese Witherspoon proves that you can’t judge a person by what they seem on the outside. As you make friends in college, you will notice that some people’s first impressions do not give them justice. Get to know those around you and don’t judge. Also, never change your true self for anything, or anyone. Movies may seem like pure entertainment but they truly do have good lessons to be learned. A common theme throughout these college movies is that you should never give up. Always strive to be the best you can be. And…cut! Meagan Hollman is a writer for MyCollegesandCareers.com. My Colleges and Careers helps potential students determine what the best online colleges are and how they can help students shape their future.